Max is a border collie lab mix who enjoys running with his mom, distracting her during workouts and snuggling whenever possible. His mom, Camille, just so happens to be one of the Fittest Women on Earth. After 4 years competing at the Crossfit Games – Camille Leblanc-Bazinet claimed the title of Fittest Woman on Earth in 2014. Since then, she’s competed in the Games every year for a total of eight competitions, finishing in the top 10 in four of them. Camille isn’t the only Leblanc-Bazinet that loves Crossfit. She’s part of a Crossfit family – mother, Danielle LeBlanc, was one place shy of qualifying for the 50-54 Masters Division in 2013, siblings Alexis, Rachel and Claude own a CrossFit box in Canada and husband Dave is a CrossFit coach. Being fit runs in the family – and that extends to the four-legged family members. Being a champion CrossFitter means fueling your body with the right nutrition to perform at your best – that’s why Camille chooses Nulo for Max. She knows that he needs the right fuel to keep up with her (and for squirrel chasing, of course). Camille dishes out a well-rounded combo of FreeStyle Lamb & Chickpeas kibble and Freeze-Dried Beef with Apples to Max. 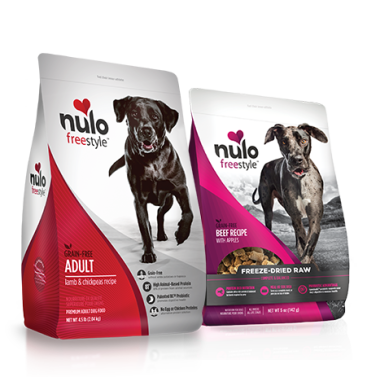 Nulo recipes contain L-Carnatine, which supports the metabolism of fats.